Joran van der Sloot's attorney says he was not properly represented when he allegedly confessed to murder. 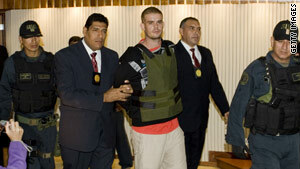 Peruvian officials say Joran van der Sloot has confessed to the slaying of Stephany Flores Ramirez. What will this development mean for the Natalee Holloway case? Watch "Nancy Grace," at 8 p.m. ET Thursday on HLN. Lima, Peru (CNN) -- The attorney for Peru murder suspect Joran van der Sloot said he's going to ask the judge in charge of the case to strike down his client's confession in the death of 21-year-old Stephany Flores Ramirez. Lawyer Maximo Altez told CNN affiliate Panamericana TV in an interview that aired Thursday that he would challenge the confession because van der Sloot was not being properly represented at the time he was interrogated. Van der Sloot, a longtime suspect in the disappearance of U.S. teen Natalee Holloway five years ago in Aruba, was arrested last week in connection with Flores' slaying. Flores' body was found in a hotel room registered to van der Sloot. Hotel surveillance video shows the pair entering his room and van der Sloot leaving alone more than three hours later.